The European Union's top diplomat has called for the United Nations Security Council to push forward and recognize a Palestinian state even without a final-status agreement between Israel and the Palestinians. "After a fixed deadline, a UN Security Council resolution should proclaim the adoption of the two-state solution," Solana was quoted as saying, adding that such a move should include resolutions regarding borders, the refugee problem, the issue of Jerusalem and security arrangements. 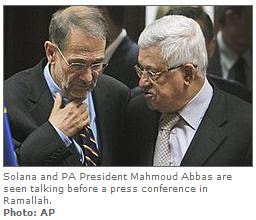 "It would accept the Palestinian state as a full member of the UN, and set a calendar for implementation. It would mandate the resolution of other remaining territorial disputes and legitimize the end of claims," Solana was quoted by Reuters as saying. "If the parties are not able to stick to [the timetable], then a solution backed by the international community should be put on the table," he said. Now, on the surface of this it looks to me that the international community is beginning to get tired of the stalemate between Israel and the PA. So, it appears that the international community might try to "force" a deal on the Israelis. And what is really interesting about all of this is that the international community is willing to "recognize" so called "Palestine" yet the PA has refused to "recognize" Israel. I'm just at a loss for words to explain that, but to me this is hypocritical and contradictory at best. And at worse tends to show the outright anti-semitism that is currently rising in the EU towards Israel. The PA has consistently refused to recognize the legitimate state of Israel, and they are going to be rewarded by being recognized themselves? Absolutely amazing. Prime Minster Benjamin Netanyahu reiterated Sunday that the recognition by the Palestinians of Israel as a Jewish state was key to resolving the Israeli-Palestinian conflict. "I am convinced that the root of the solution is in the refusal to recognize the Jewish state," said Netanyahu at a state ceremony to mark the 105th anniversary of the death of Theodor Herzl, the father of modern Zionism. "Therefore, the key to peace is the explicit recognition by the Palestinians of Israel as a Jewish state." "I look forward to the day when the moderate leaders of the Palestinians will stand in front of their people and clearly state: 'We've had enough of this conflict, [and] we recognize the right of the Jewish People to a state of its own' - and we will live alongside them in real peace the moment these words are spoken." All of these words sound good and while we wish they were true, I think most students of Bible prophecy realize that the Palestinians are not going to "recognize" the state of Israel anytime soon. The desire among the Palestinian leadership is that to destroy Israel, and as such hinders any true and genuine peace process. Another thing that was ironic about this article is that Netanyahu called on PA leader Abbas to meet with him "anytime and anywhere" to restart the peace talks, however, the Palestinians as usual rebuffed the Israeli gestures of reconciliation. The PA for their part demanded that Israel quit building settlements in the West Bank, a condition that Israel has so far refused to do despite US pressure. While making demands for Israel to make concessions and show goodwill, it is clear that the Palestinians for their part have not taken one iota of a foot forward with any of their obligations. By stating that they will "never" recognize Israel and continue to demand the "right of return", it is clear that the Palestinians are simply using proven Islamic strategies of achieving as much as they can diplomatically in a weakened state before regrouping and attacking again in a position of strength. Prime Minister Benjamin Netanyahu called on the Palestinians to relinquish the right of return demand as a prerequisite to a comprehensive peace agreement with Israel. Speaking Sunday evening at a State ceremony marking the 105th anniversary of the death of Theodore Herzl, the father of modern political Zionism, Netanyahu said "They (Palestinians) must abandon their demand to settle the descendants of Palestinian refugees in Israel and gradually 'eat away' at the State of Israel after a peace agreement is signed." As we see here and as I mentioned earlier in this Rapture Report, the Israeli PM Netanyahu seems to understand the seriousness of the Palestinian demands and has to his credit at this time stood firm in not trying to appease the enemies of Israel like Ehud Olmert did while he was in office. Netanyahu is currently acting as a strong PM in a very trying time for Israel. Israel needs a strong leadership that is unwilling to buckle under the pressure of the international community. May we pray that Netanyahu continues to stay that way in the future. As students of Bible prophecy, we know that the Bible foretells of conflict ahead for Israel here in these last days. The ancient Jewish prophets foretold of conflicts like Psalm 83, Isaiah 17, and Ezekiel 38-39. These are conflicts that pit the modern day state of Israel against their modern day, yet ancient enemies. The Bible tells us that in the last days the entire world will come after Israel and Jerusalem. Jerusalem is specifically called a "burdensome stone" that will end up causing trouble for all of those who come against her. The situation with the PA and the ongoing peace process is an issue that we should continue to watch as there have been reports of mounting pressure to make a deal between Israel and the Palestinians and it's likely that pressure will continue to intensify in the near term future. Another issue that we need to continue to focus on is the continued reports regarding the progress of the Iranian nuclear program. As mentioned in the last several Rapture Reports there is a consistent movement and sense of preparations by the Israelis for making a military move on the Iranian nuclear program due to the appeasement and lack of firm resolve by the international community to handle the issue. Let us continue to pray for the peace of Jerusalem and keep the Israelis in our prayers. The God of Israel neither sleeps nor slumbers, is not surprised by anything that happens in the world and is moving forward with His perfect plan for the redemption of mankind and Israel. Let us continue to be watchmen on the wall and keeping looking up, our redemption is drawing nigh with each passing day! !